I think we all know that Yoplait makes a lot of delicious types of yogurt–but now they’re making frozen smoothies, too! I was really excited when I was contacted to do a review of the new Yoplait Smoothie, and then was really dissapointed when I visited 3 different grocery stores in my area only to find that none of them currently carry any Yoplait Smoothies. 😦 For this reason, my posting is a little delayed, and I can’t honestly tell you about the quality or ease of using a Yoplait Smoothie. Once I find a store near me that lets me redeem my coupon for a smoothie, though, I’ll let you know about it! 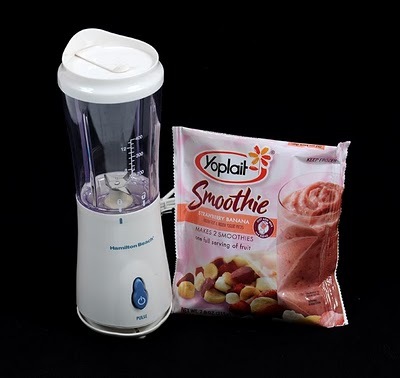 Until then, let me share some information about this neat product and also give you a chance to win your own Yoplait Smoothie and a Hamilton Beach Single-Serve Blender to make your smoothies in! Simply add milk to a Yoplait freezer package, blend, and in less than two minutes you can enjoy a nutritious and delicious smoothie guilt free! At 110 calories per serving, Yoplait Frozen Smoothies make creating the at-home smoothie convenient, simple and worry free. 2) each smoothie contains 1 serving of fruit for the day! 4) it’s fast and easy–you only have to add milk! As I mentioned before, I was also able to try the Hamilton Beach Single Serve Blender. I think it’s fantastic, and I even bought one for a friend of ours as a gift! I’m a mom who wants a filling, nutritious, and quick breakfast. I’ve found that smoothies are the answer to this, but it’s definitely a pain to make one serving in a big blender (I’m forever making too much, and spilling some as I transfer it into my travel mug). A single-serve blender is a great alternative to a big one for smoothie making. It takes up less space, and everything’s all-in-one with this blender since you can just take the blending cup part off and go with your drink! Yoplait Smoothies are sold in the frozen fruit sections of your grocery store (unless you live next to me, boo), and come in three delicious flavors: Strawberry Banana, Strawberry Mango Pineapple, and Triple Berry. Click here for a $1.25 off coupon! Buy It! Visit your local grocery store to buy a Yoplait Smoothie, and visit Amazon to purchase a Hamilton Beach Single Serve Blender. Win It! Yoplait and MyBlogSpark have teamed up to give one of my readers her own Yoplait Smoothie prize pack containing both a Hamilton beach Single Serve Blender and a coupon for a Yoplait frozen Smoothie! To enter, you will need to share your best tip for mainting health while enduring a busy life style. For example, I make smoothies in the AM for a quick way to get a healthy breakfast in as I run out the door. You must include an email address and separate comment for each entry. Contest will end 3/2/10 at 11:59, EST. Review is based on free product sample provided by MyBlogSpark and Yoplait. No other compensation was received. for a tip – We have cut out soft drinks and added fruits to our diets. I was making my children smoothies every morning until my magic bullet broke. I think smoothies are so wonderful for the entire family my kids also have no clue that i sneak fresh spinage in it also. a healthy tip: I let my son pick out the ingrediants for our daily smoothie. We've had some odd combinations, but he eats way more good stuff when it is his idea. He loves to see just how much spinach he can cram in.